This home needed an updated look in the backyard. They had a small pergola over a small patio that just didn’t give them the outdoor living space they needed or wanted. The homeowner wanted a Tuscan/Old World look. 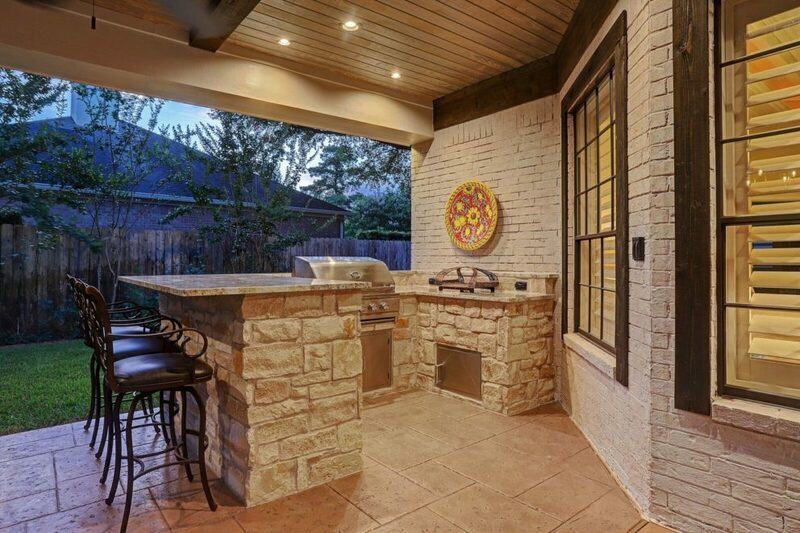 Texas Custom Patios added 705 Square Feet of covered space. It is a hip roof with a decorative false gable filled with stone to match the columns. Here is the backyard before we came in and removed the small pergola and added the new patio cover. Notice the pink brick on the home. We updated that as well. The complicated roof line made this a very difficult project. This home was perfectly set up to create a nice covered area just out the back door. We updated the paint on the French doors as well as the trim work on all the windows. We did a slurry paint over the brick to completely change the look of the back of the home under the patio cover. The floor is a stamped concrete Versailles pattern. It is a neutral color that keeps the space light and bright. The summer kitchen is located at the end of the patio cover. The large bar top is perfect for serving and dining. There is an RCS 30″ grill and plenty of storage areas. The stone facsia is a Diamante Chop. The ceiling is a stained tongue and groove ceiling with darker hand aged stained cedar beams and molding along the wall. We added stained cedar trim along the windows to create the Tuscan look the homeowner desired. The homeowner wanted to be able to sit out here when the weather cools down, so we added heaters along the outer edges of the cover.